William Seltzer Rice began his art career as a watercolorist. At the Panama Pacific International Exposition of 1915, in San Francisco, Rice became interested in the art of Japanese prints. From that time on he worked almost exclusively with woodblocks, though he relied on watercolors and pastels for sketching on location. 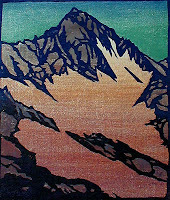 In the studio he would carve the blocks, apply oil based inks with a sable brush, and press the Japanese paper by hand. He was the author of three books - Block Prints: How to Make Them (1929), Block Printing in the School (1941), and Portfolio of Block Prints (1932). 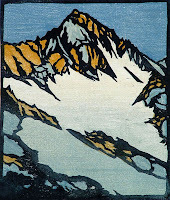 He taught in the public school systems of the Bay area, and he also taught at the many art societies, including the San Francisco Art Association, the California Society of Print Makers, and the Prairie print Makers. 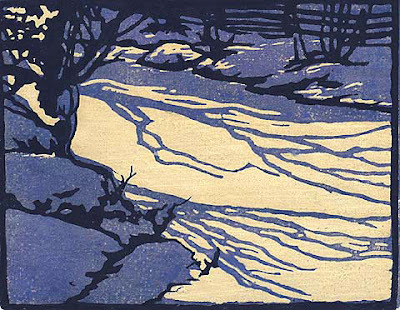 rice was clearly not the only one who felt that way, as these charming images by arthur wesley dow, and yoshida hiroshi illustrate.